The Southeast Asia is the home of many different cultures as well as unique wildlife; therefore, it would be a good destination for you to gain lots of interesting experiences. The following are the best reasons making you want to visit here once in a lifetime. Coming here, what’s waiting for you is beaming smiles and warm-welcomed feeling. You will be actually overwhelmed by the hospitality and unrivaled service of local people. Especially, if you know a few local language words, let try to visit someone’s house because you will certainly receive some invitations like that. When you visit here, it won’t cost you too much; just at an average of about $50 a day for 2 travelers and $35 a day if you go alone. These figures are based on the individual conditions of below countries. Traveling without taking any flights as well as balancing your daily life with reasonable eating and drinking (only local foods), this budget is well enough for you. You may also be said that the above budget is a little bit too much, you can even survive with a lower one. However, remember that it will true if you want to survive. Do you travel only for surviving? Not of course, don’t think about that unless you want to miss out everything making up the fantastic attraction of this region. In fact, you will spend different budgets when traveling to different countries; however, it only varies around the above one. Whether it’s a bit less or more depends on which country you choose. If you think no parties else in the world better than the ones in your own country, let go to the Southeast Asia, you will change your thought. Many youngsters travel to the Southeast Asia and take part in parties along their way. You can easily see them in many places, such as Bali, Khaosan Road, Gili Trawangan, Vang Vieng and in touristy islands around budget Thailand. In which, Koh Samui – the “parties land” is the most popular one. Another site that you shouldn’t skip is Koh Phangan- the island famous for its Full Moon party appealing to over 10,000 visitors each year. It would be a great destination in case you want to get some loose while traveling. Actually, the food of Asia is among the top reasons (if not the justifiable reason) for planning to visit here. I have ever tried once when coming to Southeast Asia and I feel that no food else in the world is better than the one here. There are so many chances for you to try delicious foods: Malaysia curry, Vietnamese banquets or food streets in Bangkok. Surely, you can’t find the cuisine in anywhere else having such vibrant, colorful, flavorful and diverse food like here. 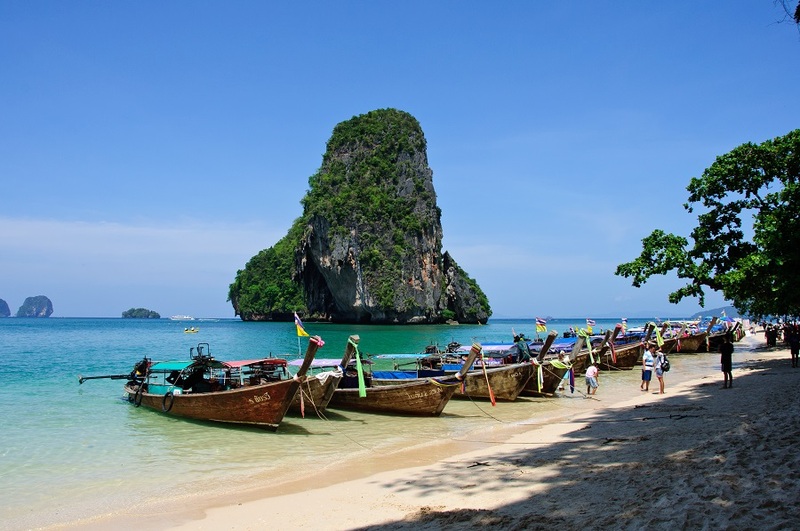 Southeast Asia is also home of most magnificent jungles and beaches of the world. If you’re planning to take outdoor adventures, it is a perfectly considerable destination. Apart from landlocked Lao, the Southeast Asia nations have remarkable coastline making up many beautiful beaches of the world. Its vast diversity of marine life is also an interesting thing that attracts lots of visitors every year, such as Boracay Island, Philippines – one of the most common getaways. It extremely superb beauty is the thing keeping people coming here. If you like spending your day lying on the beach to take the sunlight, dip into the clear deep-blue water and enjoy the beauty of endless coastlines, the Southeast Asia will absolutely satisfy you. If you think about planning your vacation like this, below suggested places will be useful for you to have a good time. The jungles from the North of Thailand, the beaches in Indonesia and Malaysia are among the best destinations to enjoy the truly natural beauty. Let try jungle ziplining, elephant expedition or bungee jumping to gain unforgettable experiences; or simply is to camp on the beach or in the jungle. All will bring you really fantastic feeling. If you enjoy camping, remember to bring a pop up tent with you. Let take some challenges and explore a new country with a wholly new culture; you will know lots of things beyond your knowledge. Buddhism is the main religion in Southeast Asia. Coming here, you’ll have a chance to admire serene monks, majestic temples and an extremely peaceful atmosphere of people. If you go to the jungles or mountainous areas, you can easily see the image of elephant handing out frequently with local people. Especially, the food market offers everything, from cockroaches to chicken heads. Besides, the contrast of spiritual, serene waterfalls and the busy life of the city make it not more distinctive. That’s what contributes to the beauty of Southeast Asia and brings unforgettable experiences while visiting here. It can be quite expensive when visiting Australia or Europe; however with Southeast Asia, it’s surely cheap and easy. Well established train and bus systems and budget airlines make it greatly easy to go around. In addition, a strong system of infrastructure, helping foreign visitors book tickets as well as travel between places easily, is set up. Anytime you come here, the thing that you should remember is to bring swim gear and shorts. Tropical is the main climate of Southeast Asia with three main seasons: hot, dry and wet. If you don’t mind suddenly rains pouring in the rainy season, it is really ideal destination. While in the hot reason, stay hydrated is an important thing. In that case, dipping into the sea water is the best solve. Not waiting longer, let take the trip now and enjoy your vacation. mper from Phoenix, Arizona. She loves outdoors and she wants to show people the endless possibilities of this world and open your mind to experience over possession. You can find practical tips about hiking, camping and survival skills in her blog hikertrack.com.